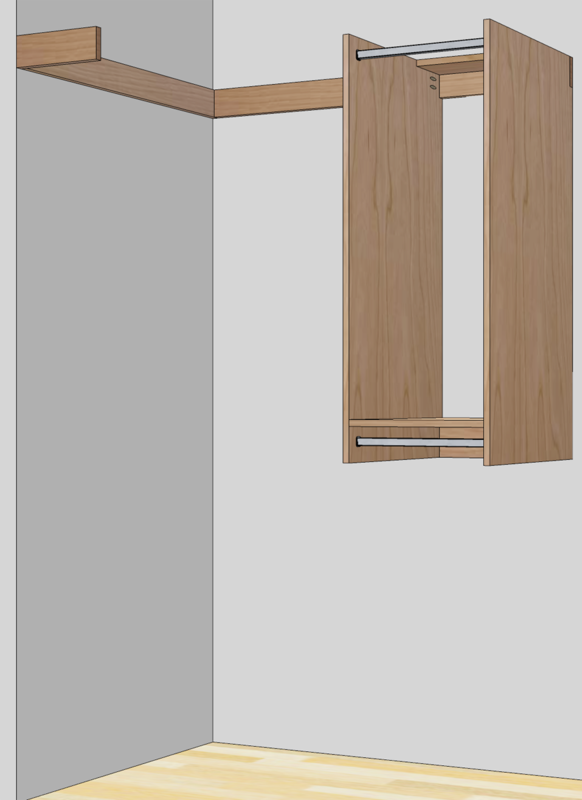 Bigger than a reach-in, too small for a walk in, this new closet organizer design for my coat closet should help satisfy it's many uses. Every so often I declutter the coat closet but it never lasts long. The coat closet serves many purposes, not only does it store coats and jackets, it's where most shoes wind up. It's where the vacuum cleaner lives as well as some other bulky items that won't fit in other closets and that seem too inconvenient to store in the garage or basement. As a result, it gets hard to use and shoes wind up disappearing in the fog of junk that winds up growing on the floor. My coat closet has an awkward size of 51" wide by 35" deep. Almost a foot deeper than a traditional reach in closet but not quite deep enough or wide enough for a proper walk in. The current layout involves one rod at 68" off the floor and 2 12" shelves above that. Because of the lack of shelf space, most of what gets stored in that closet winds up on the floor unless it can fit on a hanger. The new design has a little more hanging space but more than 3 times the shelf space. Over the years I've tried to sketch out a good plan to utilize the space more efficiently but have never been thrilled with what I came up with. 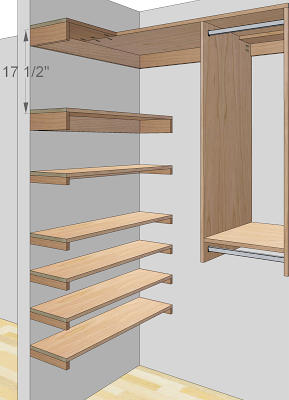 Many plans tried to turn the closet into a small walk-in layout with shoe shelves on the left and hanging storage on the right but that created a very narrow aisleway that made it difficult to use the closet and wasted space. 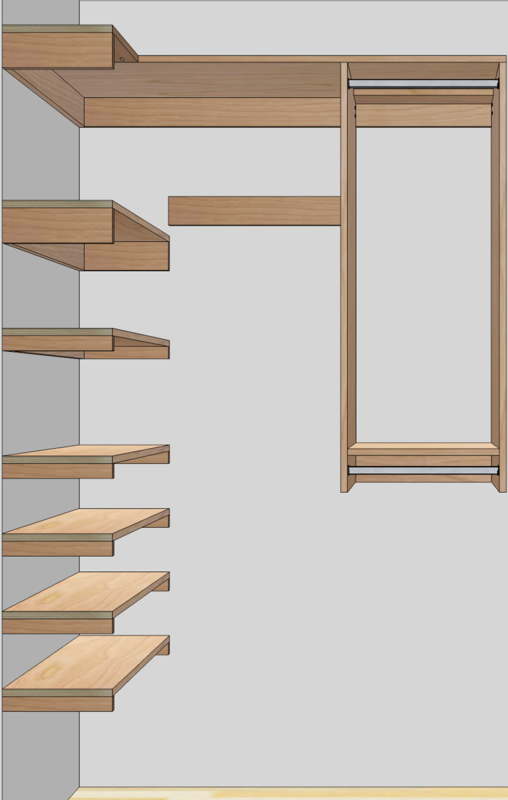 Finally, I think I've come up with a design that allows the closet to be used to it's full potential. The design consists of shelves on the left wall for storing shoes and other items, a double hang rod for shorter coats and jackets and a single hang rod for longer coats on the back wall. On top of everything is a shelf that is deeper than the current shelves to store some bulky items that can't seem to find a home elsewhere. Normally the closet rods would be positioned 12" from the back wall but that would create a few problems. You'd have to take a full step into the closet to reach your jacket which means the section of the floor by the door needs to be kept clear, which unfortunately is not always the case. 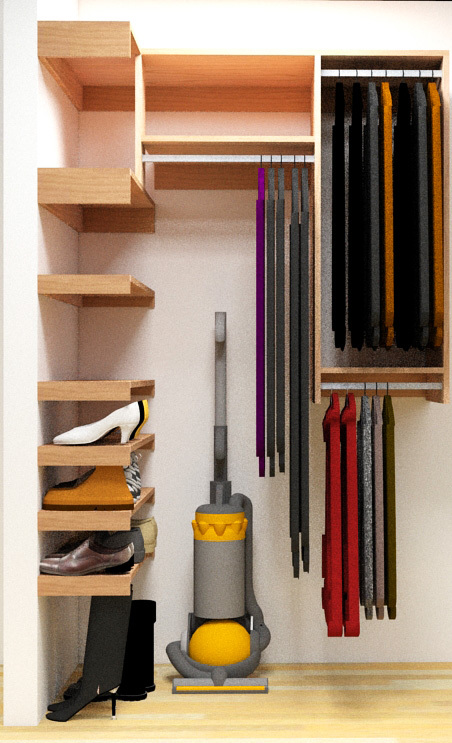 Keeping the floor clear also means a large area of the closet that can't be used for storage. In this design I bring the closet rods a few inches forward which creates a bit of a gap behind the coats to store the odd things in the closet that are nice to have handy but don't frequently get used. Things like tv trays, the bulk box of AC filters that are stored there, and it even leaves room for an upright vacuum cleaner handle so it's not right in the middle of your coats. The shoe storage is the biggest improvement. Most of the coats in the closet will fit on the double hang area which leaves most of the single hang area open and the shoe shelves accessible. If more coats are hung in the single hang area it becomes a bit of a pain to reach the backs of the shoe shelves but it beats having to dig around a pile of junk on the floor looking for them. Designing a closet organizer for this closet came down to which compromises seemed the least annoying. 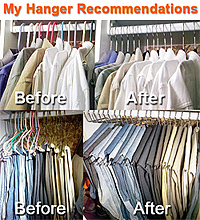 Your closet is probably not the same exact same size as mine so you'll need to make adjustments to your cut list. 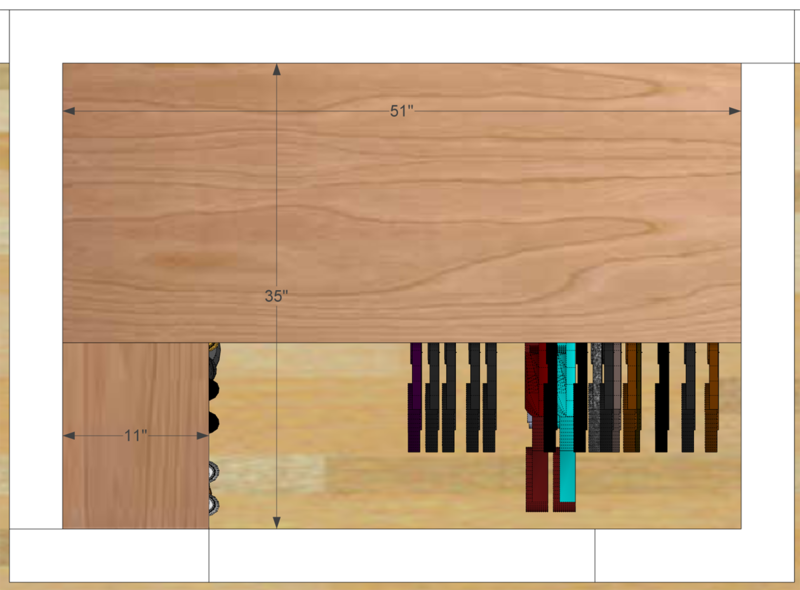 This cut plan is based on the measurements of my closet, you will need to make adjustments for your closet dimensions. I'll likely be using a 3/4" hardwood veneered Plywood for this project. 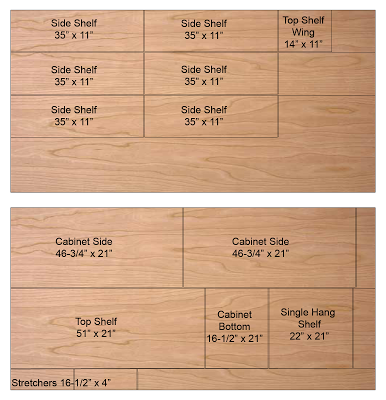 Below is the cut plan for the 2 4'x8' sheets. The 1x4 boards are used as rails to support some of the top shelves. 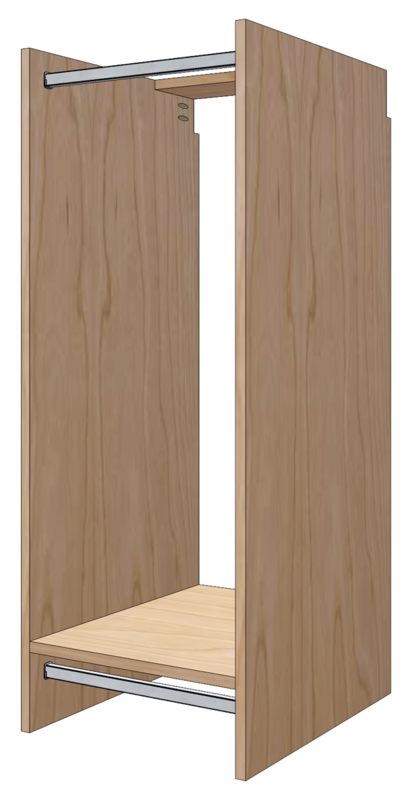 The 1x2 boards are used to support some of the shoe shelves. 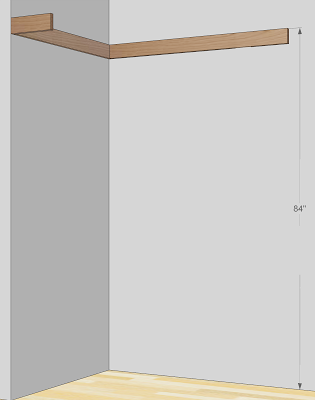 Below is a cut plan using 6' boards. 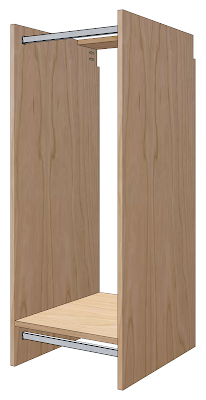 I chose to design around 6' boards because I noticed Home Depot has Sure-Wood Forest Products Maple Boards available online with free shipping and thought I'd give it a try. Boards are S4S which means surfaced 4 sides (smooth on all 4 sides) and are labelled as appearance grade. The boards may need to be a bit longer so that they can be screwed securely into at least 2 studs. 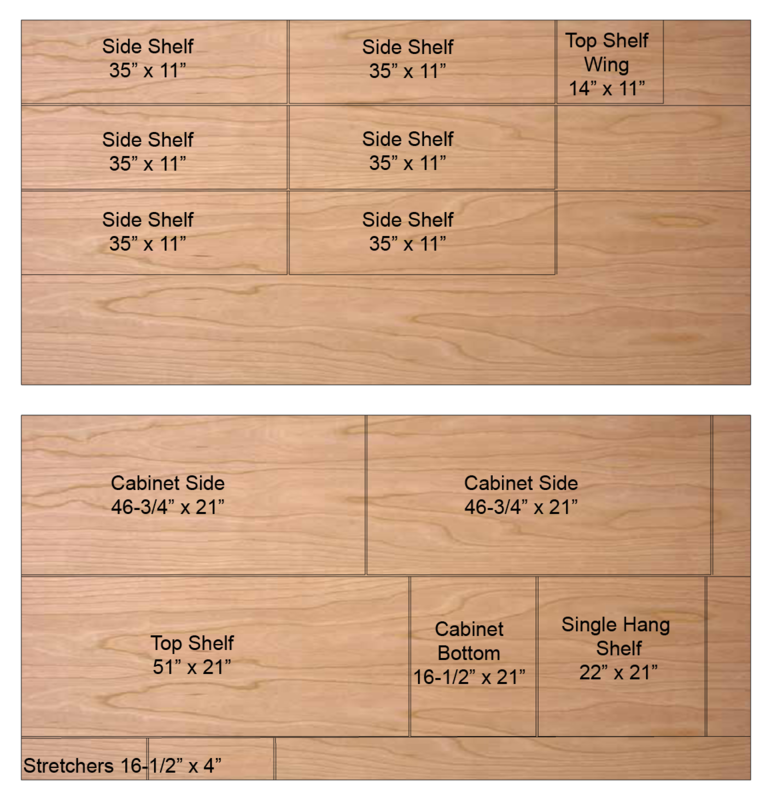 Below is the cut plan for the boards. 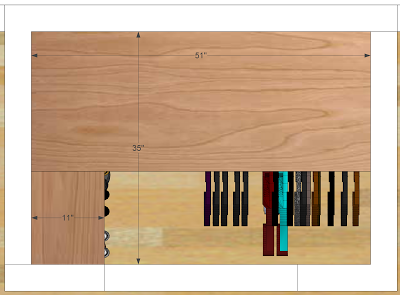 Before assembling the closet organizer I'll double check measurements then cut out all the components, apply edge banding where necessary. Might not stain to keep things bright but will apply 4 coats of Minwax Water-Based Polycrylic. Likely 3 coats gloss and final coat of satin. It's a good idea to use waterbased finishes for closets because oil based finishes can outgas for many months and make your clothes stink. 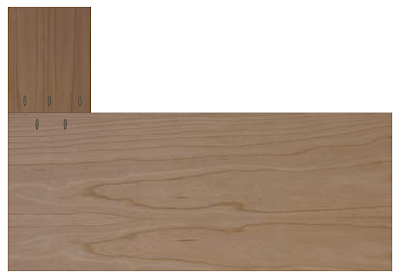 Another option is to purchase prefinished plywood and edgebanding. It's a little more expensive but will save a lot of time. While waiting for the finish to fully cure, I'll rip out the old shelves, rod and supports, patch any holes using joint compound and paint the closet with a low VOC water based paint. Either Zinsser Perma-White or Benjamin Moore Aura. The cabinet that creates the double hang section is the only component that doesn't have to be assembled in place. Start by cutting a 3/4" x 3-1/2" notch at the top of each side panel to accommodate the 1x4 top shelf rail. 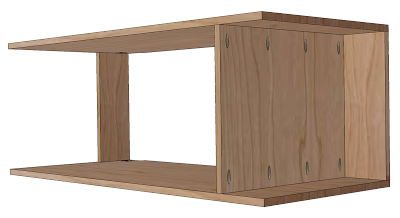 2 pocket holes should be drilled on the insides to attach the cabinet to the top rail as shown. Attach the 2 side panels together with the 2 Stretchers using 4 pocket hole screws in each stretcher. 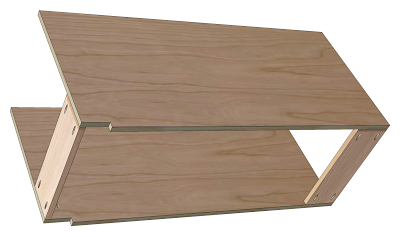 Attach the Cabinet Shelf on top of the bottom Stretcher so that it's flush with the front and back of the cabinet. Use 8 pocket hole screws as shown. Looking at the cabinet now, I think it would be a good idea to round the bottom front corners before edgebanding and finishing so there isn't a sharp corner someone could bang their head against when bending over to get something off the closet floor. 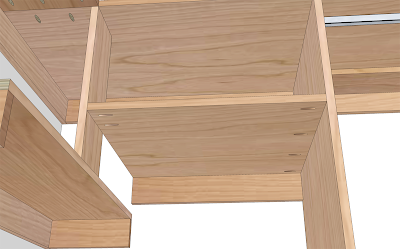 Install the closet rod flanges so the top of the rod is 1-1/2" below the top of the cabinet and shelf respectively. The center of the rod should be 2" from the front of the cabinet. Using a level, locate the high point in the floor along the back wall. From that point, measure 82" up from the floor and draw a level line all the way around the closet at the 82" mark. Trim and attach the top rails so the top is flush with the level line where necessary. Use 3-1/2" wood screws to secure the rails to studs. Start at the front/left part of the closet, next the left wall, finally do the back wall. Mount the double hang cabinet in the right corner and make sure it's level and pressed up against the top rail so the top of the cabinet is flush with the top rail. Secure it to the wall by driving 3-1/2" wood screws through the bottom stretcher into studs in the back wall. Drive screws into the right side wall studs as well for extra support. Finally drive 4 pocket hole screws into the top rail using the pocket hole screws drilled when assembling the cabinet. Start by checking the fit of the Top Shelf and the Top Shelf Wing. 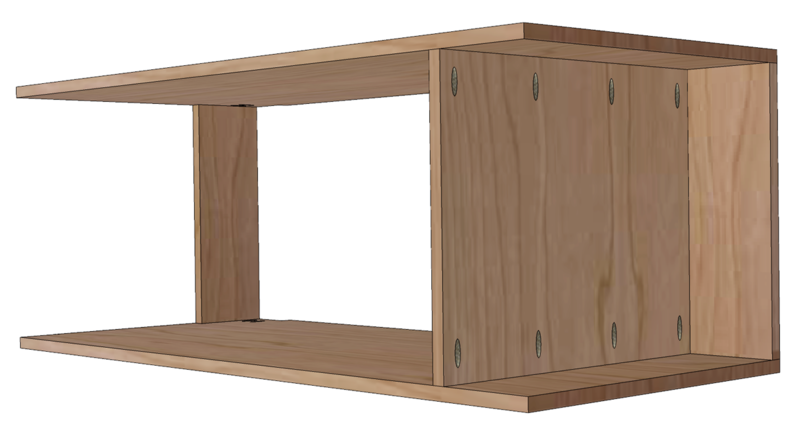 Make any adjustments if necessary then using 5 pocket hole screws, attach the wing to the correct side of the shelf as shown in the bottom view below. Position the top shelf and wing on top of the top rails and screw it in place using 1-1/2" flat head wood screws. Make sure to predrill pilot holes and countersinks so the screw heads sit flush. Drive screws about every 8-10" around the perimeter into the top rail as well as the sides and top stretcher of the double hang cabinet. Draw level lines to help position the side shelves. The first line should be 17-1/2" down from the bottom of the top shelf as shown. The back supports might need to be longer than 11" so that it's long enough to be screwed into at least 2 studs. For the rest of the shelves you can space them as best suits you. 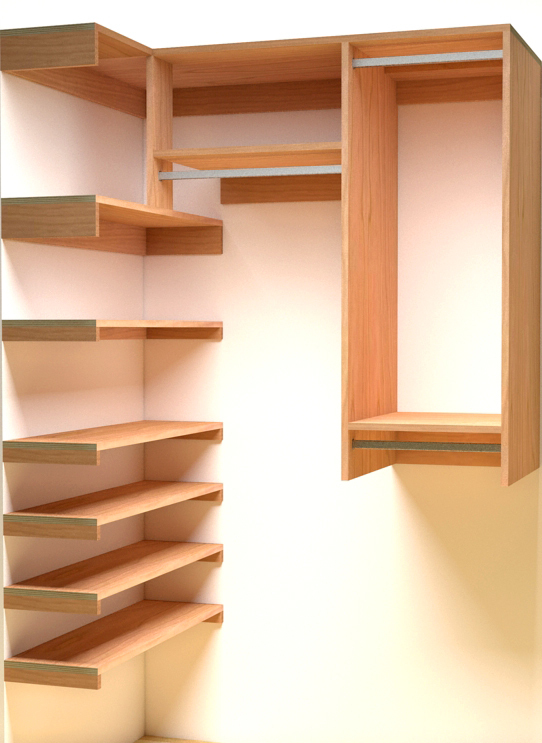 Keep in mind 12" spacing is good for folded clothing and other items, shoe shelves only need 7" of spacing. Once all the supports are installed, attach the shelves and secure them with 1-1/4" wood screws (pilot holes and countersunk). 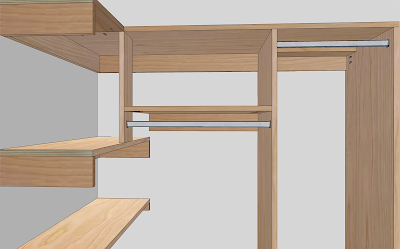 Measure and draw a level line 72" above the floor and install the Single Hang Shelf Rail. It needs to be at least as long as the shelf as well as long enough to be secured into 2 studs. Use 3-1/2" wood screws to attach it to the wall. Prepare the pocket holes in the bottom of the Single Hang Shelf. Now position the Single Hang Shelf on the shelf rail but do not secure it yet. Use it as a guide to position the Single Hang Support. The Single Hang Support has 2 pocket screws at each end on the back. Once you have it aligned properly, secure the Single Hang Support to the top shelf and first shelf. 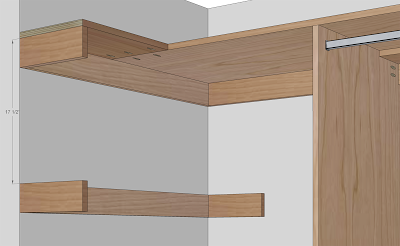 With the support in place, attach the shelf to the back rail using 1-1/2" wood screws (pilot holes and countersunk) and pocket hole screws into the left support and the double hang cabinet side on the right. 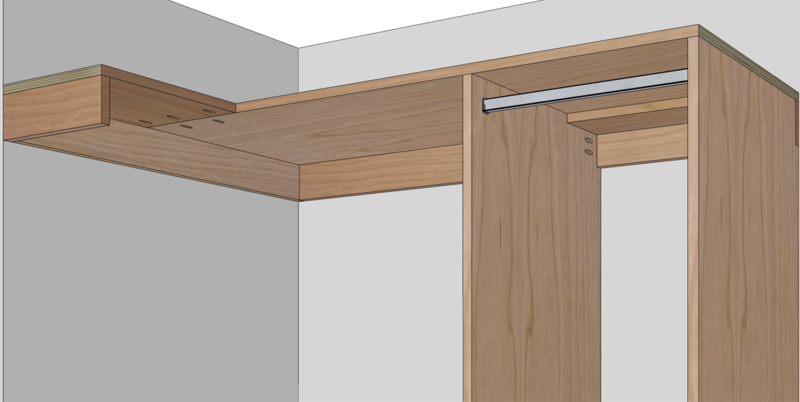 Finally, install the closet rod flanges under the Single Hang Shelf so that the rod sits 1-1/2" below the shelf and 2" back from the front of the shelf. The coat closet organizer is now complete. Time to fill it back up and hope it doesn't get as messy as fast! You have finished reading Step In Closet Organizer Plans and many articles about Tech Gallery in our blog this, please read it. and url link of this article is https://littlebitjohnny.blogspot.com/2013/01/step-in-closet-organizer-plans.html Hopefully discussion articles on provide more knowledge about the world of new tech gadgets.